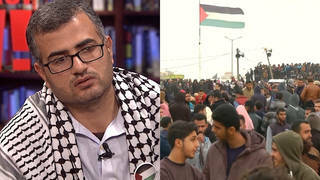 Award-Winning Palestinian Journalist Mohammed Omer Details Abuse by Israeli Security Officials | Democracy Now! Award-winning Palestinian journalist and photographer. He is the Gaza correspondent for the Inter Press Service and was abused by Israeli security officials on his way back to Gaza from London, where he had just received the prestigious Martha Gellhorn Prize for Journalism. AMY GOODMAN: We turn now to award-winning Palestinian journalist Mohammed Omer. The twenty-four-year-old journalist and photographer from Gaza was physically and psychologically abused by Israeli security officials late last month. He is a correspondent for the Inter Press Service, was on his way back home after receiving the prestigious Martha Gellhorn Prize for Journalism in London. Mohammed Omer joins me right now on the phone from Gaza. Welcome to Democracy Now! AMY GOODMAN: Can you tell us what happened and when it happened? You were just coming back from London after receiving your award? MOHAMMED OMER: Well, let me mention before I start that I’m also writing for the Washington Report on Middle East Affairs in Washington, D.C. When I was coming back from my award ceremony and also a speaking engagement, I was stopped for nearly one hour and a half before an Israeli Shin Bet officer came to me and started collecting my bags, which were securely checked already. I kept waiting for some time until they got my luggage and they started checking everything. So he went down to my knees, where he pulled down my underwear to make me totally naked. I looked at him, and then I told him, “OK? So what are you trying to do here?” And he said, “Go right, go left.” I said, “I’m not going to move right or left. I’m totally naked.” And then he started humiliating me and laughing. And I continued explaining to him, “Why do you treat me that way? I’m a human being, and I don’t deserve this kind of treatment.” Then he said to me, “Well, still, you have seen nothing. You will see more.” He continued to interrogate me and to continue to search me, stripping and searching me while I was totally naked. And then he told me, “Go and get your clothes on.” I put my clothes on, and I went back to the hall where the travelers are coming. And then I had all my clothes on, and I found the Shabak agents. They are checking everything. They have collected all the documents that I have in my suitcases. They’ve collected all the information — my cell phone, my memory cards, my business cards for parliament members I met in the Swedish parliament, in the Dutch parliament, in the Greek parliament, and also they have seen also the House of Commons parliament members that I met. And then he started on me, “Oh, you were even on the BBC World Service.” I said, “Of course, I was on the BBC World Service, talking about Gaza and the humanitarian situations there.” “You were at this parliament, at that parliament. You were speaking here, you were speaking there.” I said, “Of course,” because he can see all the people I met, he can see all the business cards that I have in there. I collapsed during the interrogation. I fainted and — on the ground. And I started vomiting everywhere. And then the soldiers, they started gathering around me. I estimate nearly one hour and a half vomiting on the ground. And one of the Shabak officers — I was unconscious for most of the time, but I can remember one of the things that they were doing to me. He was using his nail fingers and pinching me all the way, trying to cause me pain under my eyes and under the soft part of my eye. I thought what these people are doing is basically they are trying to torture me. And one of them who was trying to do that, the same thing, pinching me using his nail fingers under my ears, and then one other of them who tried to — who put his shoes on my neck. I could feel actually the outline of his shoes on my neck, moving right and left. I started vomiting again and again, especially after one of the soldiers, he had both his two fingers inside the hole between my neck and my chest. There is a little hole, and he put it all the way inside and tried to grab my bones, to grab me from my bones different times. That was the most painful thing. And then, other one who was trying to put his hands on my chest and all his weight on my chest. He was — it was actually meant to break me and to break my ribs, because he put all his weight. And the man who continued, or the soldier who continued to do — to put his feet and his shoes on my neck, that can’t be first aid at all. When I told the doctors here in Gaza what happened to me, they said that can’t be a first aid, and it can’t be something like that, that’s torture. They continued to do that until one of the soldiers, he dragged me out from my feet, and my head on the ground, on the floor, and my back on the floor. He dragged me all the way, taking me into a few meters away, where they started to make fun, and they were joking. I could hear they were joking while I was lying down. At that moment, I felt how it feels for a black African man to be under the apartheid system. That’s what I felt at that moment. I was unconscious, on and off, and suddenly I found that they are taking me in a wheelchair, and they have said that I had nervous breakdown. They take me to an army doctor. I could see the M-16 gun with the army doctor who tried to treat me. He tried to put — to install the heart machine to do heart test on my body. And then he suddenly — and still, there is one on the table while I was lying down. He is pinching me, trying to torture me in the same way. And I think he is also the same one who was doing the job before. They continued to do it. And after that, I heard the soldiers shouting at each other in Hebrew. And I could hear the English word more than one time, “ambulance, ambulance, ambulance,” after they realized that I am not conscious for some time. When I was transferred to the hospital, I found myself suddenly in a hospital surrounded by doctors, and that is — I asked him where I am. They say, “You are at Jericho hospital,” where I was — I called — the hospital called the embassy, and the embassy came from there to take me. And I was transferred from Jericho to Gaza, where I was transferred to the Gaza European hospital, where I spent many days, having nearly sixty days — six days it’s been since I was in the hospital. AMY GOODMAN: Mohammed Omer, we just have two minutes, and I wanted to ask — John Pilger, who gave you the award, a well-known Australian journalist who lives in Britain, a filmmaker, wrote a piece about your treatment and said, “The former ambassador Jan Wijenberg said: ‘This is by no means an isolated incident, but part of a long-term strategy to demolish Palestinian social, economic and cultural life … I am aware of the possibility that Mohammed Omer might be murdered by Israeli snipers or bomb attack in the near future.’” Again, that was the former Dutch ambassador who said this. Your final comments? MOHAMMED OMER: Well, I think this is possible. Once Israel has killed our colleague, the Reuters cameraman, they can kill me. I thought that the fact that I’m being given this international prize was going to bring me protection, but who cares? Israel doesn’t care. Israel is trying to provoke the public opinion. They’re trying to provoke everybody and trying to torture people and to kill them. I mean, will Israel care to kill a journalist? Of course not. They have killed a family on the beach of Huda Ghaliya; eight family members were killed. They have killed five children who were collecting strawberries two years ago. And they continue to kill on a daily basis people from day to day. Will they care to kill Mohammed Omer? Of course not. AMY GOODMAN: Mohammed Omer, I want to thank you for being with us, award-winning Palestinian journalist, just won the Martha Gellhorn Prize for Journalism with Dahr Jamail in Britain. Mohammed Omer is the youngest winner of the award.